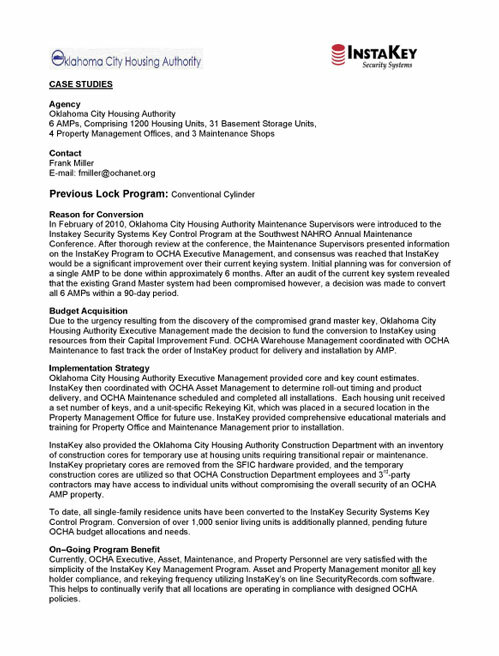 In February of 2010, Oklahoma City Housing Authority Maintenance Supervisors were introduced to the Instakey Security Systems Key Control Program at the Southwest NAHRO Annual Maintenance Conference. After thorough review at the conference, the Maintenance Supervisors presented information on the InstaKey Program to OCHA Executive Management, and consensus was reached that InstaKey would be a significant improvement over their current keying system. Initial planning was for conversion of a single AMP to be done within approximately 6 months. After an audit of the current key system revealed that the existing Grand Master system had been compromised however, a decision was made to convert all 6 AMPs within a 90-day period.